Social Media Marketing in Toronto, Guelph, Kitchener, and London! Social Media is an online media that allows one to reach a large group of people very easily and communicate with them. It can provide groups, apps, communication, and updates on a variety of topics of interest to the user. Interested in Social Media but not sure where to start? 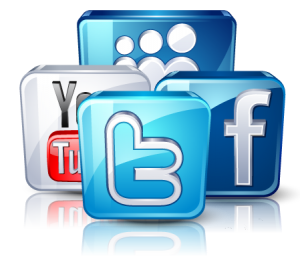 We can help you manage social media tools and leverage social media to its maximum potential. We are specialists in Twitter, LinkedIn, Instagram and Facebook. Twitter, for example, is a great way to reach a very large audience quickly as anyone can follow you and receive your status updates. It’s a great way to keep abreast of what’s going on in the world with regard to your interests and connect with your audience of followers. Follow someone and many people will follow back. Post interesting information that your audience will enjoy and engage with. Linked In is a great way to communicate and learn about what’s going with other professionals and network online. A fully filled out profile is important for people to find about you and engage with you, as well as posting interesting content to keep the top of mind. The 900-pound gorilla of social media, this is the most important social network out there. It has a vast capability to communicate and connect with others along with a massive and highly focused advertising network. This network is focused entirely on the visual presentation of images and has massive engagement rates that make it powerful. It is owned by Facebook. Finally, there are tools to help you figure out your engagement and automate your social media updates such as Buffer and Hootsuite. It is important to use these tools to save time and track your results. Contact your social media experts today to get the dialogue going!